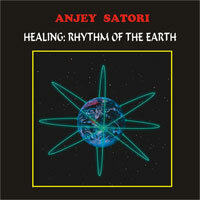 Album “Healing: Rhythm of the Earth” contains a recording of meditative music, which was modeled with 7,83 Ghz frequency. Artificially made generation of this frequency can bring human body to conformity of the Earth’s resonance. This frequency calms down human brain and in the same time stimulates it. Researchers notice here a peculiarity of the form of brain’s synchronization. The 7,83 Ghz frequency can improve concentration, attention and intellectual skills. Scientific studies and practice show that using the 7,83 Ghz frequency in magneto-therapy can regenerate weak physiological functions of the body, increases vital force and positively influences on body’s cells. This rhythm is necessary for all living. Today space ships are being equipped with special magneto-therapy devices that help astronauts during their trips into the space. Human brain, when it healthy also pulses with the 7,83 Ghz frequency. The meditative music of the album also makes a good influence on function of Muladhara and Svadhistana Chakras. Immediate download of 1-track album in your choice of MP3 320, FLAC, or just about any other format you could possibly desire.